The 60ml size Aloe Clear that can be taken on planes! Aloeclear is a soothing and cooling roll on gel solution. Formulated to provide a 24 hours defence against ingrown hairs, razor bumps, razor burn, or any redness after hair removal. The 60ml size Aloe Clear that can be taken on planes! Cools, soothes and refreshes instantly! 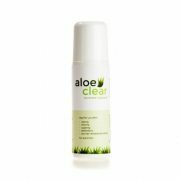 Try Aloe Clear for 21 days using it morning and night, if you don’t see clear results we will give you your money back! A patch test is recommended on first use. Fantastic product and I will be back for more.